On May 1st, we celebrate the rule of law and the role of the law and legal processes, including the court system, in promoting democracy and freedom through our celebration of Law Day. First envisioned by the American Bar Association’s then-president, Charles S. Rhyne, in 1957, National Law Day was established as a day of national dedication to the principles of government under law by President Dwight D. Eisenhower in 1958, and May 1st was designated as the official date of celebration by a joint resolution of Congress in 1961. No State shall make or enforce any law which shall abridge the privileges or immunities of citizens of the United States; nor shall any State deprive any person of life, liberty, or property, without due process of law; nor deny any person within its jurisdiction the equal protection of the laws. Until the Fourteenth Amendment was ratified in 1868 there was no provision in the federal Constitution or federal law to prevent the States from enacting laws that “denied to their own citizens the equal protection of laws or deprived them of life, liberty, and property, without due process of law.” Westel Woodbury Willoughby, The Constitutional Law of the United States at 177-78 (1910). For a more detailed analysis please see the section on the 14th Amendment in Constitution of the United States of America: Analysis and Interpretation available at https://www.gpo.gov/fdsys/ – the Federal Digital System. In honor of this year’s Law Day Theme, Miranda: More than Words, we would like to highlight the Constitutional Law Resources that are available at the Law Library. The Law Library’s collection includes the United States Constitution; however, you can read the U.S. Constitution as well as other primary documents in American History online through the Library of Congress’s website here. If you are interested in learning more about the history of the U.S. Constitution, check out the Georgetown Law Library’s Constitutional Law and History Research Guide here. For assistance with your Constitutional Law research, please contact us at the Law Library! Yesterday was Law Day. Each year, on May 1st, we celebrate the rule of law and the role of the law and legal processes, including the court system, in promoting democracy and freedom through our celebration of Law Day. First envisioned by the American Bar Association’s then-president, Charles S. Rhyne, in 1957, National Law Day was established as a day of national dedication to the principles of government under law by former U.S. President Dwight D. Eisenhower in 1958, and May 1st was designated as the official date of celebration by a joint resolution of Congress in 1961. 2016 marks the 50th anniversary of the 1966 U.S. Supreme Court decision in Miranda v. Arizona, and in the past 50 years, the Miranda warning, “You have the right to remain silent…” has become a part of America’s popular consciousness. This year’s theme is Miranda: More than Words, and it explores the U.S. Constitution’s procedural protections including and beyond Miranda v. Arizona. You can learn more about the theme here. 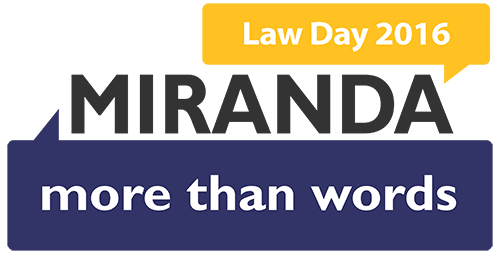 If you are interested in learning more about Law Day and this year’s theme, check out the ABA’s 2016 Law Day page!